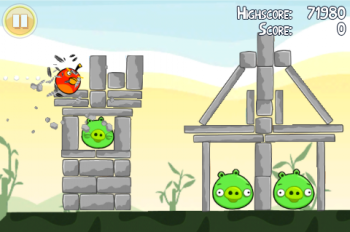 Rovio wants new Angry Birds fans via its retail release. Whether you like or dislike Angry Birds, you're in good company. If you haven't played it, though, you're becoming part of an increasingly lonely crowd. While Rovio's juggernaut bird-slingshot simulator is one of the cornerstones of the digital games market, the Finnish developer wants to use its recent foray into the retail market as a way of drawing even more players under its massive, red wing. The console-based Angry Birds Trilogy debuted at number 16 on the UK bestsellers chart, suggesting that the series has some legs in the traditional brick-and-mortar market. "I think a lot of people will experience Angry Birds for the first time via this, even if it's not the person who buys the game," says Kalle Kaivola, an executive producer at Rovio. "It could be a parent, sibling, roommate or friend sharing the couch with them." The company has no immediate plans to shift its digital focus, but Kaivola is quick to remind consumers that retail still comprises a large percentage of Rovio's transactions. "[We] have far more products in retail than with digital. We have a very significant retail business." Angry Birds Trilogy has sold respectably, but it hardly mirrors the massive breakout success of its downloadable counterparts. Just by the law of averages, the game will undoubtedly draw in some new fans, but what's more likely these days: A family sharing a console game around the TV, or each one individually downloading it for his or her phone?